Spring officially arrives in three days, but you would never know it in the Northeast where we have been freezing since Thanksgiving! We’ve turned the clocks ahead so at least the days feel longer and suggest warmer days are around the corner. I was scrolling through my camera roll today and found a picture that made me skip right over the impending Spring and think about Summer. Don’t the colors in this dish make you dream of farmstands flush with jewel toned fruits and vegetables? 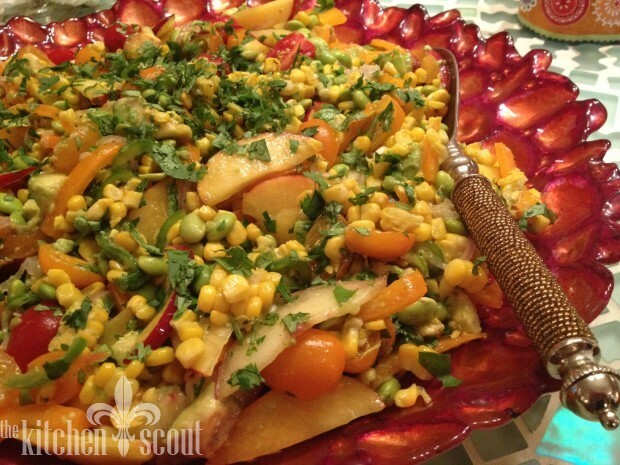 Summer Vegetable “Ceviche” consists of shelling beans, fresh corn, nectarines, avocado, bell peppers and cherry tomatoes which are marinated in a lime vinaigrette, just as fish ceviche would be prepared. I had the good fortune of making this salad with my cousins, Jean and Joyce when we spent a weekend together last summer at Jean’s vacation home in Virginia Beach. Joyce and I travelled from Massachusetts together and started menu planning at the airport! Joyce is also a culinary school graduate and an amazing private chef and caterer whose website can be found here. We had such a wonderful weekend, filled with cooking, eating, bongo boarding, laughing, crying and attending a barre class that nearly killed me. The original recipe for the ceviche came from Stockholm-based blog Green Kitchen Stories. The only change we made was substituting edamame for fresh lima beans. The dish was stunning to look at, and absolutely delicious. The salad can be made well in advance of serving as it can sit for up to 8 hours. Yes, you could make it now by swapping out a high quality frozen corn and perhaps a mango or papaya for the nectarines. Me, I’ll just gaze at the picture a little longer and think about Summer. If using lima beans, cook in a small saucepan of salted boiling water until tender, about 10 minutes. Drain the beans and rinse under cold water. In a large bowl, whisk the lime zest and juice with the olive oil, scallion, jalapeno and shallot; season the dressing wtih salt. Gently fold in the lima or edamame beans, corn, nectarines, avocado, orange pepper and tomatoes. Refrigerate the "ceviche" for at least 2 hours. Fold in the cilantro just before serving and serve the "ceviche" chilled. The salad can be refrigerated for up to 8 hours. The flavors were still bright after a day in the fridge. Hi Anne, thanks for catching that! All fixed now!